Two thousand years of history are represented in this 250 acre facility. Stretching from the pre-historic Adena Indians and the rise of the American Woodland Tribes all the way through the canal years this land has seen history unfold before it. The area is operated by the Ohio Historic Society and is divided into three separate attractions all for one price. Members of the Ohio Historic Society will be admitted free. His name was John Johnston born in Ireland March 25, 1775 and arrived with his family at age eleven in Western Pennsylvania. In 1792 Johnston was earning a living as a driver of an army supply wagon for General Wayne near Pittsburgh. The following year he went west into the frontier of Ohio and was supplying Fort Greenville during the signing of the Greenville Treaty. This is when he first saw his future home near Piqua Ohio. He would later seize the opportunity to buy the land when its owner, James Flinn, defaulted on payments of a federal land fee. 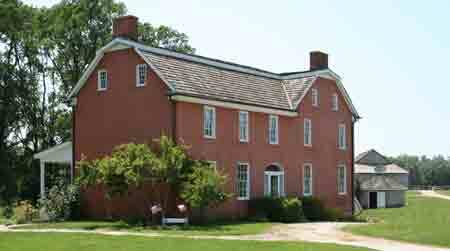 Johnston’s first home was a log cabin but in 1810 he began to build the brick home which still stands today. During this time he became a close friend to both General William Henry Harrison and the local Indian tribes. In the beginning of the War of 1812 many American Indians took the opportunity to side with the British striking back at the young American nation. John Johnston was known far and wide for his sympathetic dealings with local tribes and was asked to do whatever was possible to keep the tribes from joining the war effort against America. Johnston was given scrip for the feeding of the Wyandot tribe and at times they lived all about is farm. The following statement from the Wyandot Tribe was presented to President Monroe in November, 1819 regarding John Johnston and his actions during the war of 1812. In 1829 John Johnston finished his brick home complete with outdoor kitchen, spring house and cider house. During his life he would be the honorary pallbearer to Daniel Boone as well as have a honored position in the procession during the 1800 George Washington remembrance celebration in Philadelphia. He would be involved in both state and national politics and was extensively involved in the local community. Mr. Johnston was responsible for this section of the canal and would server for 25 years as a trustee of Miami University. John Johnston died at the age of 85 in 1861. Today the Johnston home is available for touring and has been furnished as it was in 1829. There is even a cast iron pot which was used in the battle of Fallen Timbers. Interpreters will take you through the home giving you an interesting presentation of the house and the times. Guests will be able to explore the outdoor kitchen, spring house and the cider house. The farm was used to produce pork and fruit which Mr. Johnston sent to market by way of the Miami - Erie Canal. 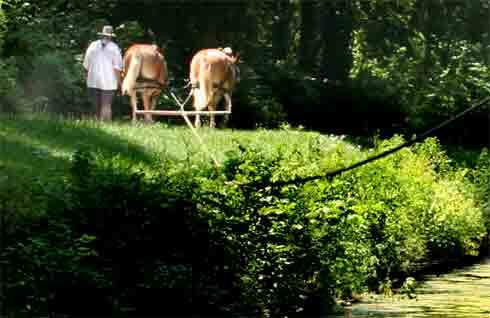 You will learn about life on this farm during the short duration of the canal days in Ohio. 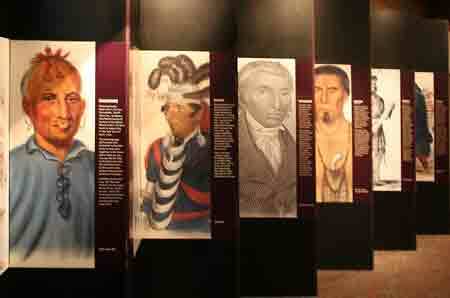 Built to resemble General Anthony Wayne’s Fort Piqua block-house the museum displays artifacts telling the story of the Ohio Woodland Indians as well as the Pickawillany battle site. Exhibits also bring the canal period into a sharper force with a cut away scale model of the General Harrison canal boat. The museum has been recently updated and provides an interesting view into the history of this tract of land. The museum is located on a small hill above the Miami and Erie Canal and provides a shaded patio to view this restored section of the canal. This replica canal boat, built by the Albany New York company of Scarno Boat Building, is 70' long. 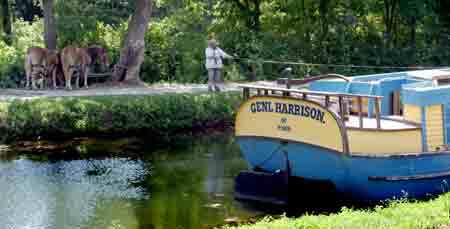 It has been recreated to permit guests the experience of canal boat travel. It has been made with an aluminum hull, unlike the original boat, to permit it to last longer. The General Harrison is pulled by 2 mules up the canal to lock # 9 and then spun around and for the return trip to the museum dock. The trip lasts about 30 - 40 minutes with docents giving a historic feel for life on the Miami & Erie Canal. It was a relaxing trip with an abundance of information allowing the guests to better understand the canal boat and the times canal boats ruled Ohio transportation. The tribe was known as the Piankeshaw and their chief was La Demoiselle. They traded with the French for many years and were ill used by them. The French and their allies were known for their unfair trading practices. The tribe had become disillusioned and wanted to end the influence of the French and for this reason they moved from their home in the north to the confluence of Loramie Creek and the Great Miami River. They named this place Pickawillany. British traders traveled from Western Pennsylvania to present the Chief with many gifts. Their purpose was to build a fort at the site of this Indian camp. Their gifts were plentiful and the Chief granted the traders request. 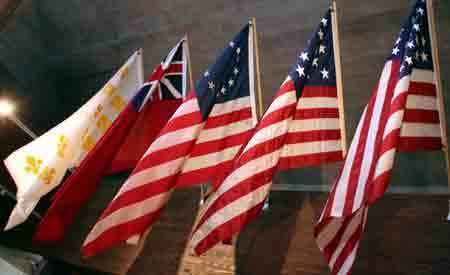 In 1751 a fortification was constructed as a trading post for over 50 British traders. Chief Demoiselle now was call Old Britain. Pickawillany began to thrive and grew almost daily with Indians arriving from other tribes. France unhappy with this turn of events sent 250 soldiers down the Ohio and at the mouth of every river emptying into the Ohio they placed a lead table indicating this was French territory. This party traveled up the Great Miami River and arrived at Pickawillany and for several weeks tried to convince the tribe to return to the French traders. When this mission failed other plans were placed into motion. On June 21, 1752 the French and their allies attacked Fort Pickawillany. The fortification was a standard stockade with a central two story structure. They surprised the community taking hostages of the Indian women working in the fields holding them until the British traders came out of the fort. Upon leaving the forts protection one was killed instantly as well as the Chief Old Britain. This attack would be the first of many confrontations of the two super powers leading to the great French and Indian War. The Piqua Heritage Festival is held over the Labor Day Weekend features an old fashioned rodeo, crafter's, re–enactors, kids games and crafts, a petting zoo, antique displays, a one–room school house, a pre–1870 encampment, quilting, sheep dog demonstrations, music, food and much more. The festival invites all to take a closer look at our heritage in the Ohio frontier. This event will draw performers such as the Tippecanoe Ancient Fife and Drum Corp, period reinactors, Native American traditional performers as well as impersonators of Hopalong Cassidy, Lash Larue and the Red Ryder, the Lone Ranger and John Wayne. The festival has many other events too numerous to mention. The festival is usually held on Labor Day Weekend each year.